BRIDGEPORT — It seems like every passerby has something to say about J. Taylor Wallace's in-progress carving job of a Honey Locust tree outside McGuane Park. They criticize him for ruining a perfectly good tree. He explains that it's already dead. They stop for photos. He continues chainsawing, unabated. Last week, a guy asked bluntly, "What is this, some kind of yuppie s---?" 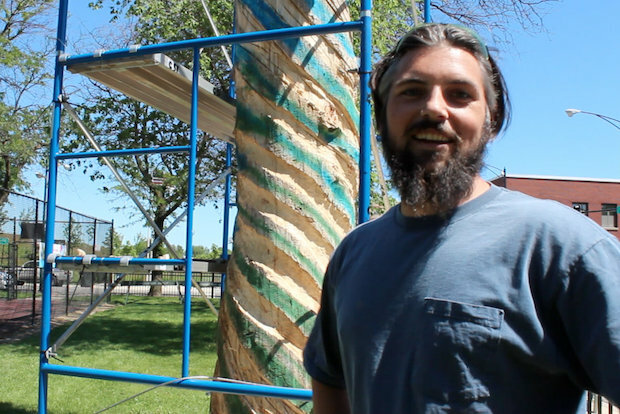 Wallace's work is part of a city program that commissions artists to make public art from dead or dying trees infested with the emerald ash borer. The work, sponsored by the Chicago Park District and Chicago Sculpture International, is getting underway at Washington, Marquette, McGuane, Armour Square, Humboldt, Olympia and Riis parks. For Wallace, the owner and metalsmith behind Metal Magic Interiors at Bridgeport's Bubbly Dynamics building, the tree-carving project amounts to "a lot of ambition." Wallace gained notoriety a few years ago for creating a barbecue smoker shaped like Sarah Palin's head. Harnessed into a safety device, he scurries to the top of a towering scaffold system surrounding the tree to begin carving with a chainsaw, angle grinder or heavy-duty chisel, "the type that Noah built the ark with," he said. Sawdust flies like flurries onto busy Halsted Street as the shapes take form. When it's complete, the design of ascending spirals will sort of resemble mangled screws that jut out in different directions. Wallace said he wanted to "keep the organic form" of the tree. "Having this type of project, you can respond to the shape of the tree," he said. Some of the 10 commissioned artists will carve into the trees, as Wallace has. In Olympia Park on the Northwest Side, artists Karl and Indira Johnson are carving "elaborate alternating bands of Morse code and overlapping hands layered like sediment around the tree." Others will simply "add" to the trees, organizers said. That includes Margot McMahon, who's piece, "Flock," hangs figures of songbirds in flight and a sculpted owl onto a 125-year-old elm tree in Jackson Park.